Physical Activity and Falls in Older Men – Do Mobility Limitations Make A Difference? Moderately vigorous physical activity (MVPA) is good for all older men, and according to new research conducted at University College London (UK), it also reduces the risk of falls in some over-70s. One third of men aged 70-90 years have trouble getting about outdoors. For them, 30 minutes of MVPA daily— enough to cause slight breathlessness and sweating— almost halves the risk of falling. MVPA strengthens their leg muscles and improves fitness and includes activities like walking for errands or gardening. However, among the two thirds who have no mobility limitations, only the most active 10 percent— who do 30 minutes of MVPA or walk more than 9000 steps daily — actually increased their risk of falls by half. It’s likely they are going beyond their strength and balance capability, so would benefit from balance-challenging exercise programs to prevent falls. Overall, the benefits of exercise outweigh the risks for older men and they should all do some exercise rather than none. 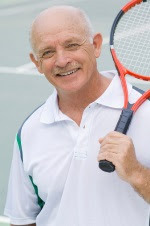 This entry was posted in AAOS, Articles, Fitness, Performance, Prevention, Science, Sports, Tennis, Training by sportsmedicineweekly. Bookmark the permalink.